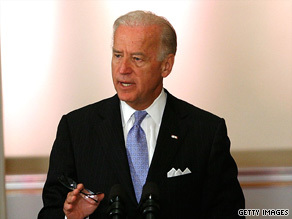 Joe Biden calls health care reform the "foremost economic and moral issue"
WASHINGTON (CNN) -- Vice President Joe Biden on Friday tried to rekindle momentum for overhauling health care, warning a group of small business owners that failure to act soon would have catastrophic consequences for the private sector. Vice President Joe Biden warns the federal government can't "sustain this trajectory of health care costs." Biden made his pitch as senior administration official Nancy-Ann DeParle huddled with Democrats struggling to forge a consensus on a health care bill before the planned August congressional recess. Health care reform is the "foremost economic and moral issue that this administration is determined to deal with," Biden told the business leaders at a meeting near the White House. He noted that premiums for employer-provided health insurance have doubled in the past nine years, rising three times faster than wages. As a result, small business owners are "being forced to make some very difficult and ... unnecessary choices," he said. "[They] are faced with deciding to provide coverage that is increasingly swallowing up more and more of their bottom line, not providing coverage at all or having to raise the cost of the service or product they're selling, making them uncompetitive." The vice president's remarks came a day after fiscally conservative House Democrats known as "Blue Dogs" effectively put the brakes on health care legislation by pressing the Democratic leadership for significant changes to the draft bill. As Democratic leaders worked feverishly to finalize details of the legislation, initially slated for a Friday rollout, the Blue Dog Coalition released a letter Thursday night saying the bill "lacks a number of elements essential to preserving what works and fixing what is broken." Forty of the group's 52 members signed the letter, making it clear that a major block of the House's Democratic Caucus wants some concessions in return for their votes. Shortly after the letter's release, a group of Blue Dogs met in the office of House Speaker Nancy Pelosi, D-California, with other leaders for nearly two hours. Rep. Mike Ross, D-Arkansas, a leading negotiator for the Blue Dogs on health care, told reporters that he and Reps. John Tanner, D-Tennessee, and Allen Boyd, D-Florida, also met with White House Chief of Staff Rahm Emanuel on Wednesday to go over their concerns. Boyd said that no deals were struck Thursday night, but the group agreed to meet Friday with Reps. Henry Waxman, chairman of the House Energy and Commerce Committee; Charlie Rangel, chairman of the Ways and Means Committee; and George Miller, chairman of the Education and Labor Committee. Boyd and other members representing rural areas pushed leaders to adjust the rates that Medicare pays rural doctors and hospitals for health care services. "From a practical standpoint in terms of a timeline, a bill doesn't come into the House chamber until you've got the votes to pass it, and I don't think they have the votes to pass it at this point," Boyd said. "We've got to try to get to point where we're comfortable." Pelosi on Thursday repeated her pledge that a government-run health care plan would be included in the House bill, but Ross said conservative Democrats have major reservations about how a public option would work. In the letter and in the meeting, the conservative Democrats stressed they did not want a "Medicare-like" structure for a public option. "What we are saying is -- if there is a public option, it can't be based on Medicare rates unless the regional disparity in Medicare rates is fixed," said Ross, who also plans to press for more controls on government spending on health care and more savings from changes to Medicare. House Majority Leader Steny Hoyer, D-Maryland, waved off any suggestions that Thursday night's development was a setback. "Let me make it very clear that everybody in that room thinks we ought to pass health care," Hoyer said. But he acknowledged they still need to work through the details.